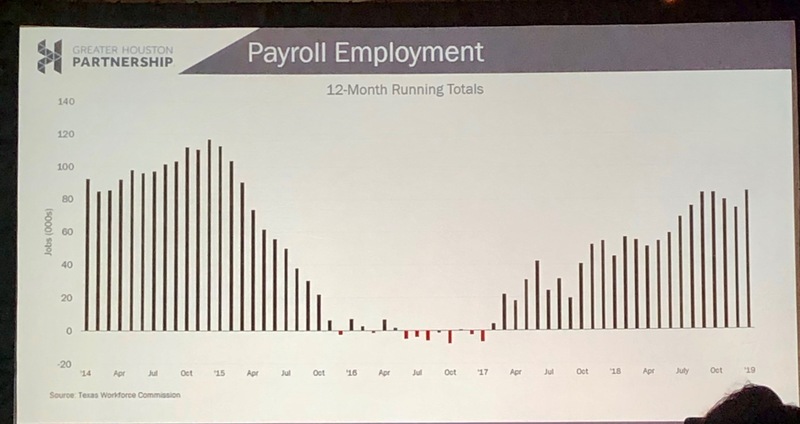 This slide shows the resilience of Houston's economy-the big drop in the middle is the oil dip we experienced a year back. The diversification of Houston's economy prevented the City from experiencing a recession like what happened in the 80's oil bust. The pace we are on is sustainable because it does NOT depend on $100/barrel oil. Energy is profitable again, even at $50/barrel oil. Unemployment rate at all time low. Trade remains very robust, even with the current trade issues. Houston has become a net exporter. Companies continue to move to Houston, with significant relocations and expansions. Are there any worry signs? Crude output has doubled, without any significant hiring of people. Some of the best paying Houston jobs have been in the oil business, and they may never be as high as they were. Exports and trade wars are an unknown factor. Immigration worries-0 last 10 years, 40% of hires were foreign born. 40% think we will be in a recession by 2020. *Are we going to talk ourselves into a recession? There are no tell-tell signs that we should be headed that way. Affordability in Houston is becoming a problem. Home prices are going up faster than income is rising. 71,000 jobs forecast to be added in 2019.